Say ‘YES’ to eating crickets | Rrampt. You’ve got some friends over, and everyone’s hanging out in the kitchen. You ask if anyone would like another drink as you pour out a package of snack food into a small bowl. Someone excitedly asks you – oh, what are these? He must have known it wasn’t my first cricket-eating rodeo, because he usually eases people in with his chocolate covered insects before moving onto the seasoned, popcorn-like snack. I have had experience eating crickets in Thailand and so I popped a few into the ol’ gullet without flinching. I knew they were tasty, I knew they were healthy, and as I found out from touring Joe’s Cricket Farm in Owen Sound, the harvesting process is also both environmentally friendly and ethical. Joe Shouldice is a graphic designer turned cricket farmer, and a recent Brooklyn, NY resident turned Owen Sounder; he made both these life decisions while on an RV road trip across North America with his partner, Kristine, and their two young children. They were initially intending to return to Toronto, where he’s originally from, but somewhere along the way started courting smaller cities. Once they settled on the idea of starting a cricket farm, something that first popped into their minds after reading the UN’s FAO Report from 2013, they wanted the ideal town to set up their farm. They arrived in Owen Sound as tourists, and it wasn’t long before they were residents. I was introduced to them on their first night in town, and I wrote out a list of things to see while they were visiting. I guess I gave them a good list because they eventually traded their campsite at Harrison Park for a house in town, and subsequently a new business. And it wasn’t just the endless waterfalls, parks, trails, and beaches that enchanted them, it was the personalities and plenteous culture. The Grey Bruce Pride Parade last summer really made an impression on Joe and Kristine – they knew this wasn’t your typical small Canadian city. And he’s not wasting any time seizing that opportunity. 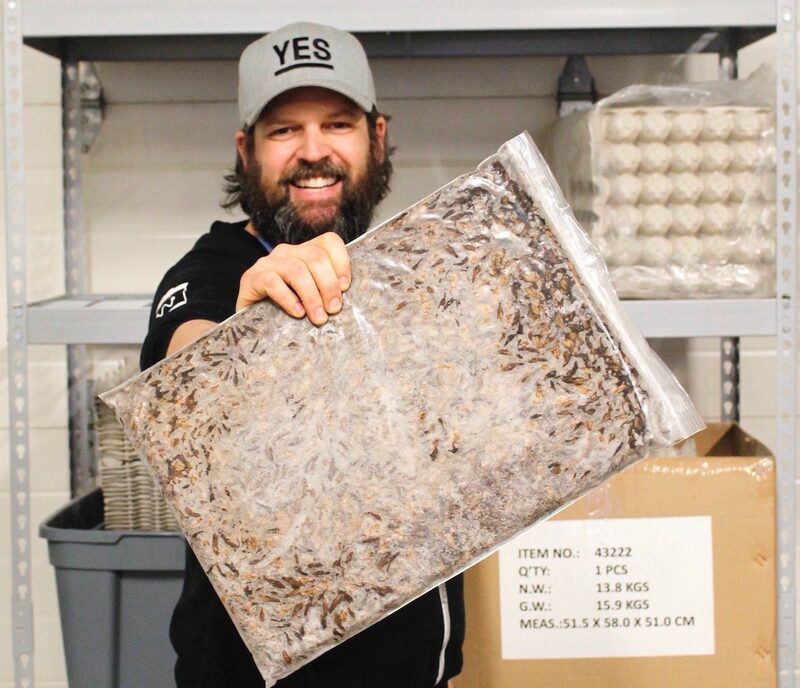 His farm is set up in the industrial park of Owen Sound where he’s already raised tens of thousands of crickets and started harvesting using a freezer, oven, and a dehydrator. If you’re interested in the process, he keeps his followers updated through his Instagram posts at Yescrickets. No one around here is doing what he’s doing. 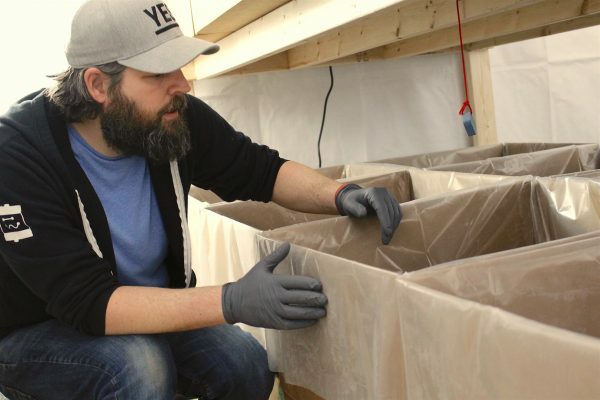 But while this is a fledgling market, Joe is just one farmer in a growing network across North America who are helping each other succeed and grow the industry. “I’m super lucky to have a network of other farmers and cricket consultants if you can believe it,” he says. They’re considered an underdog in the arena of snack. He cites the millions of dollars behind brands like Dorito’s to include chemically-altered ingredients to blow our minds with flavour, but he’s banking on the fact that people are looking to consume fewer ingredients they struggle to pronounce these days, not more. 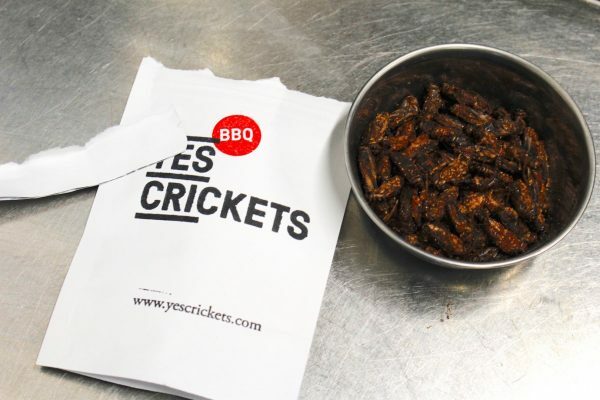 A bag of crickets only has three ingredients, but what might blow your mind is the health benefits – crickets are not only high in protein (a staggering 13 grams of protein per 2.5 teaspoons of powder) but also calcium, iron, and B12. Additionally, they’re a major source of essential omega-3 and omega-6 fatty acids. Research is also pointing towards healthy probiotic benefits. Many are adopting the habit of eating crickets, but the majority of the population will need to see it normalized before they jump on board. Celebs like Angelina Jolie, Kanye West, and Nicole Kidman are all helping to change the culture and make it more acceptable. The thing is, we may have to jump on board eventually. With projections of an additional 2 billion people by 2050, eating and producing meat at the rate we’re accustomed to won’t be sustainable. 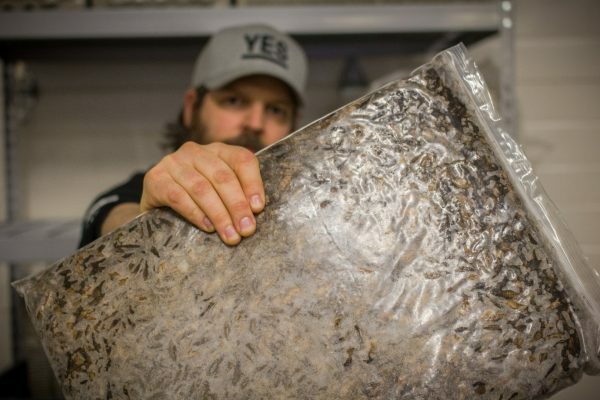 The protein powder that’s made from crickets may be the way to go for Yes Crickets. 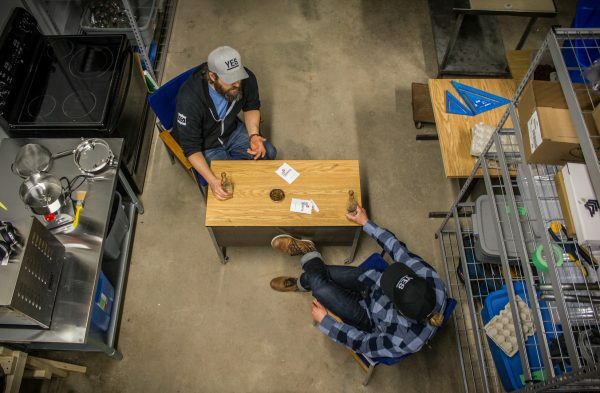 “Business might be more heavily skewed towards the wholesale market at the moment,” Joe says, and he’s working towards supplying powder for companies to make protein bars and shakes. But he’ll need to increase his harvesting, big time. He’s harvested around 10,000 crickets to date, which is still a small amount in cricket farm terms. His total farm population is about half a million, which is still only a fraction of where it will need to be. The supply chain is still forming but the demand is definitely there. 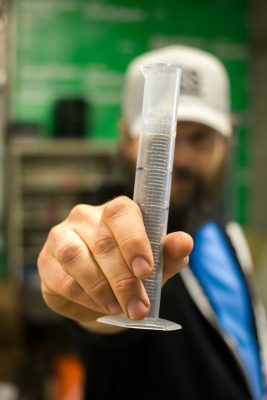 “Most of the people making cricket products, they can’t get enough crickets,” he says. 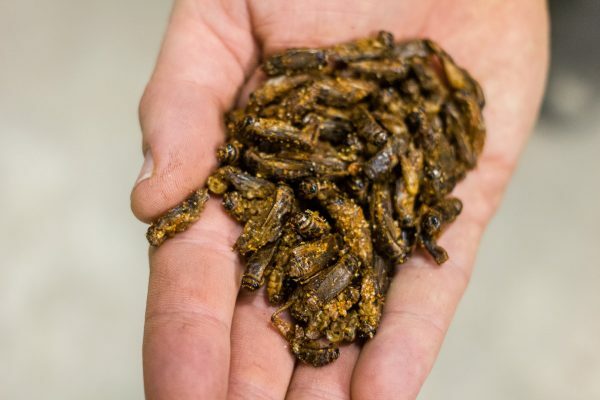 Eating crickets for the health benefits is a strong reason to begin adopting them into our diet, but it’s the environmental and ethical reasons that support the case even more. In comparison to cows for equal output of protein, Joe posits, crickets use only 2% of the water, 12% of the land and 10% of the feed. Additionally, crickets only output 1% of the methane that cows do. And cricket frass (crap) is an incredible fertilizer. Furthermore, on an ethical standpoint, the manner in which crickets are harvested – by freezing them- mimics nature. It’s a natural thing for them to lose all vitals when the temperature drops below zero at night, but then they reanimate (come back to life) in the morning. 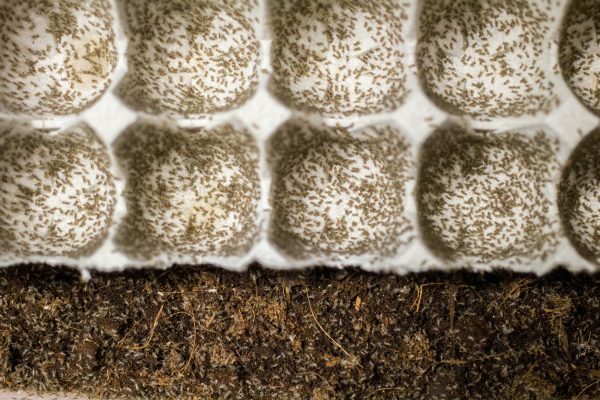 “By keeping the crickets frozen for longer, they can be harvested without pain,” Joe says. But even with all the heath, environmental, and ethical reasons, Joe knows full well that it will ultimately come down to the taste. There are many people who will come to it first for the curiosity – the risk takers – but for the industry to really take off, it’s gotta become normalized. And that may take awhile, but the tipping point is on the horizon. Big brands like Presidents Choice are already leading the way with their own cricket powder for sale in major supermarkets. The industry needs the mainstream media to be fair and favourable, “and they have been,” says Joe. He likens it to the introduction of sushi to North America in the 70s. At first people were shocked, and curious, but it soon became normalized, and now there’s a sushi joint on most busy streets in North America. “Some prominent chefs coming on board…are really doing a lot in making amazing looking, tasting dishes,” he says. And just like any product, packaging will be important. Joe spent fifteen years as a graphic designer so he’s got that on his side. His previous studio in Brooklyn was called YesYesYes Design. He wasn’t joking about having an affinity for that word. And so he’s brought a little piece of New York with him to Owen Sound with Yes Crickets. It’s just one ‘Yes’, but he’s hoping it’ll be enough to get people to on board. Next articleCan you spell humorous and heartwarming?